To download you survey results you will need to start by clicking “Export” in the function bar at the top of the report (marked in red on the screenshot). This will open the menu for all export alternatives that is available for your survey. There are five different formats to download the result to. Just click on the desired report to select what you wish to include in the specific export. Include open text answers: Will add all individual free text answers to your exported PowerPoint file. Include wordcloud: Will add wordclouds connected to the free text questions to the exported PowerPoint file. One chart per matrix row: Will split matrixes into multiple slides. One PowerPoint slide per row in a matrix. Select template: If you have one or more custom templates added for the powerpoint export you can select which one you want to use. Anonymous: Makes all the answers in the report anonymous when you look at the result. Hide top meta dashes: Will hide the information-bar containing“Days left”, “Days active”, “Answers”, “Answers %” and “Completes” etc from the exported report. Individual answers: The report will be exported in individual answers instead of an aggregated result. Page break after answers: Connected to “Individual answers”. Adds a page break in the PDF after each of the individual answers. Answers instead of Wordcloud: Adds wordclouds to the exported PDF instead of free text answers. Page break after questions: Adds a page break in the PDF after each of the individual questions. Hide names after answers: Will hide the name/e-mail of the person who have left a free text answer. The report will only present the free text answer, not who left the answer. 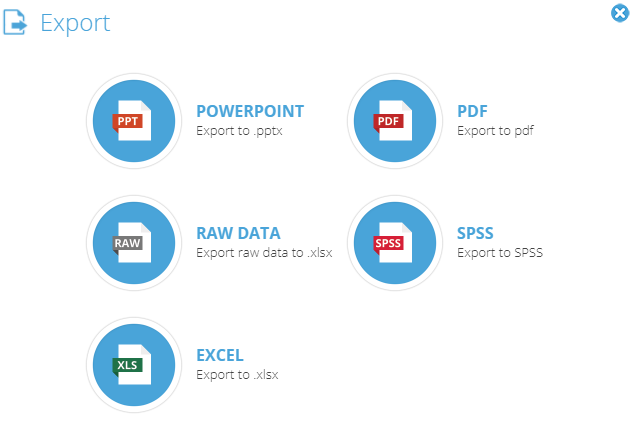 Export your result into a RawData format for Excel. This excel file contains three tabs; Values, Labels and Weights. Values: Displays the answers in numerical values. The alternatives are replaced with numbers for the number of what response alternative the respondent have answered. Labels: Displays the answers in text form. The answers are presented in the same format as they are in the survey report. Weights: Displays the results in weighted form. One weighted questions the raw data will display the number that is weighted to the specific response alternative that the respondent have answered. Download your result to SPSS format. Export the results to an aggregated Excel report. One sheet per question: Adds an additional sheet in the Excel file for each of the individual questions. Include open text answers: Will add all individual free text answers to your exported Excel file. Include charts: Adds charts to your questions in the exported Excel file.